Overview - It is 1971, and journalist Raoul Duke barrels toward Las Vegas—accompanied by a trunkful of contraband and his unhinged Samoan attorney, Dr. Gonzo—to cover a motorcycle race. His cut-and-dried assignment quickly descends into a feverish psychedelic odyssey. Director Terry Gilliam and an all-star cast (headlined by Johnny Depp and Benicio Del Toro) show no mercy in adapting Hunter S. Thompson’s legendary dissection of the American way of life to the screen, creating a film both hilarious and savage. Like an unstoppable, drug addled fever dream, echoing from some forgotten, dimly lit, neon dimension, 'Fear and Loathing in Las Vegas' comes seeping out, oozy and erratic, from the troubled minds of two mad geniuses, director Terry Gilliam, and author Hunter S. Thompson. An unflinching, darkly humorous and disturbing trip through the looking glass, this adaptation of Thompson's novel of the same name, takes no prisoners and holds no punches in an unrestrained circus act of visual style. Gilliam harnesses an arsenal of filmic techniques to form maddening images which breathe colorful life into potentially unadaptable prose. With exceptional performances and a loose but methodical narrative, the film adds up to a commendable achievement that may at times seem deceptively superficial. The story follows a journalist named Raoul Duke (Johnny Depp) who serves as a stand in for author Thompson himself, and his lawyer, referred to as Dr. Gonzo (Benicio Del Toro) as they navigate through the seedy carnival landscape of Las Vegas, covering stories and searching for the ever elusive "American Dream." What follows is an episodic descent into drug fueled insanity as Duke and Gonzo teeter on the edge of psychosis in the midst of greed, materialism, and depravity. Depp disappears completely into the role, becoming an eerie approximation of Hunter S. Thompson's famous alter ego. His eccentric mannerisms and speech patterns are all dead on, providing a welcome mixture of comedy and thoughtful introspection. Duke is a character who carries a sense of hopelessness. He's a man who feels the world has seen its best days, squandering the optimistic potential it once held. The character wobbles between tripped out incoherence and intelligent, cynical musings, and Depp handles all aspects of the performance in an effortless dance of extremes. Del Toro is equally impressive as Dr. Gonzo, who also balances between fits of violent hysteria and calm eloquence. Though the story itself is thin, with no real plot or traditional character development to speak of, the segments fold into one another and add up to a greater whole, which is expanded upon by the manner in which it's all shot. At one point, Duke narrates, "Was I just roving around in a drug frenzy of some kind, or had I really come to Las Vegas to work on a story?" and one gets the sense that Gilliam too was asking himself that very same question while making the film. There is a balancing act here between form and content and between lunacy and meaning. One might watch this film and garner no real insight from the characters' various dalliances with degeneracy, but is there actually a method to the madness? Is there really a point to the strange adventures of Duke and Gonzo? Well, yes and no. Some of the meandering, drug induced paranoia appears to be just that, meandering and drug induced, but other scenes in the film hold greater substance. Thompson wrote about his subjects not as they really were, but as he saw them, not as they occurred, but as they appeared to him. Since he was usually under the influence of one drug or another, or perhaps several at the same time, this view was often quite unique. Gilliam evokes this same perspective with the form of his filmmaking. From wide lenses, to erratic, neon lighting and strange hyper real compositions, blocking, and camera movements, every choice is made with the intention of unsettling the audience, and putting them at a level of unease which mirrors the paranoid and distorted perspective of the film's main characters. This stylistic choice parallels Thompson's own structural choices in his writing, all attempting to illuminate a greater truth through a psychedelic lens laced with LSD. Though some might see the visual choices as excess attempting to mask a thin plot, at its best this approach actually showcases the horrors that surround Duke and Dr. Gonzo, with a greater lucidity than a more natural and traditional take ever could. The cynical, disturbing, and satirical points that Thompson makes in his writing are now made through images that take on the same biting wit and madness of his words. Gilliam has created a work that respects the source material while still carving a cinematic identity of its own. Though at times scenes can appear unnecessary and bizarre, with no real purpose, that stark, visceral shift from reality is actually the purpose, providing a strange and unique perspective that could only be formed in the world of cinema. 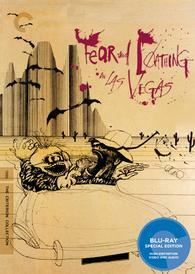 In the end, 'Fear and Loathing in Las Vegas' is a wholly unique and original take on difficult material, one that still manages to remain a remarkably faithful adaptation. Though no film could really capture Thompson's writing completely, Gilliam has perhaps provided us with the best effort we're likely to ever get. Depp and Del Toro give fearless and impressive performances, and the visual style is relentless and powerful. The story may appear thin and at times incoherent or meaningless, but there are indeed deeper observations layered beneath the murky puddles of filth, and glittering, lonely lights, exposing the angst and desperation of a generation of dreams deferred. Though certainly not for everyone, there are rewards here for those brave enough to take the journey. Presented with a 1080p/AVC MPEG-4 transfer in the 2.35:1 aspect ratio, the video quality here looks to accurately represent the movie. As discussed, this film is a visual explosion of style that creates an otherworldly, carnival show appearance. This stylistic choice, though fitting, isn't always exactly pleasant to look at. A natural layer of grain is present throughout. Colors can vary wildly, faithfully reproducing the film's various looks and deliberate choices. Some scenes pop, and offer a great sense of detail and depth, while others are more murky and understated. Contrast is usually high, and blacks are deep. Overall, the video here is faithful to the movie. With its harsh and intentionally wild color palette and lighting, the transfer can appear a bit manic, but that's simply the nature of the source. Criterion has done a good job preserving the director's intentions. The movie is provided with an English 2.0 DTS-HD MA track and an optional English 5.1 DTS-HD MA track, with English SDH subtitles. Both tracks serve the film well with crisp, clean dialogue. Well, as crisp and clean as mumbled insanity can be. There is an overall lack of fidelity though, with both tracks exhibiting a thin quality. Dynamic range is mostly flat but balance between elements is good. Bass does kick in during some of the livelier sequences in the 5.1 track but remains pretty muted in the 2.0 mix. There is some nice left and right directionality in the 2.0 track, and though mostly front loaded, the 5.1 track does have some welcome use of surrounds sending the chaotic bustle of Vegas casinos, crowds, and imaginary bats in all directions. Though never quite as impressive as one would hope, the 5.1 track does add another layer of immersion into the crazy world Gilliam and crew have created. There were some issues reported with Criterion's original DVD release of this film, with apparent discrepancies between the 2.0 and 5.1 track that left some dialogue and effects mysteriously dropped from the 5.1 mix. Thankfully, those issues seem to have been corrected, as I noticed no missing elements in scenes that were known to exhibit this problem before. Overall, the audio here is good but doesn't quite hold the immersive quality that a film with such wild and creative sound design should. Still, both tracks represent the movie faithfully and have no major technical issues. Criterion has put together an extremely strong package of supplements, including three audio commentaries, various stills galleries, deleted scenes, and featurettes. The supplements are divided into two sections labeled The Film and The Source. All extras are provided in 1080i unless otherwise noted, and appear to come from mostly upconverted sources with no subtitle options. Also included in the package is a booklet featuring an essay by critic J. Hoberman and two pieces by Hunter S. Thompson. Audio Commentary by director Terry Gilliam - This solo track from director Terry Gilliam is a fun and informative listen. Gilliam exudes a nice level of excitement and genuine enthusiasm for the film which makes for an engaging discussion. Topics touched upon include the pressure of staying true to the book, methods used to keep the budget low in order to avoid studio interference, the film's anti-materialism undertones, and Gilliam's refusal to clarify the narrative to provide easy answers. Of the three tracks, this is definitely the most revealing and worthy of a listen. Audio Commentary by stars Johnny Depp, Benicio Del Toro, and producer Laila Nabulsi - The three participants here were recorded separately and then edited together for this track. Despite the pieced together approach, the commentary does have a nice flow to it and each participant offers some interesting bits of information. Depp and Del Toro mainly focus on insight into their process and developing their characters. Depp goes into detail about getting to know Thompson and how that led to a close friendship between the two. Both also address a common misconception that they were actually on drugs during the making of the movie. Nabulsi offers detailed accounts about the film's troubled production and long road toward reality. Overall, a worthy listen. Audio Commentary by author Hunter S. Thompson - As one might expect, this is definitely not your average commentary track. Author Hunter S. Thompson is joined here by producer Laila Nabulsi who attempts to steer the conversation toward topics pertaining to the film. Thompson demonstrates his trademark eccentricities and wit throughout, pointing out scenes that he doesn't like, taking frequent jabs at Terry Gilliam's expense, going on strange and irreverent rants, and of course making even stranger random screeches and yelps for no apparent reason. Thankfully, in between the insanity are some genuinely interesting insights into the writer and his thoughts on the film. Unfortunately, his deep, mumbled speech can be hard to make out at times. Though perhaps the least informative of the tracks, fans of the author will definitely want to take a listen. Deleted Scenes (HD, 11 min) - Three deleted scenes are provided here in stereo sound with optional commentary by director Terry Gilliam. The scenes are in pretty rough shape and appear to come from a very low quality source. The first scene is a completely expendable minor extension of one already in the movie, but the latter two hold more substance. One features an amusing conversation about the rise of witchcraft in Los Angeles, and the other is a thematically rich sequence which originally acted as one of the final scenes in the movie, but was unfortunately misinterpreted by test audiences. Storyboards (HD) - Storyboards for seven scenes from the film are included in 1080p. Stills Gallery (HD) - Ninety-five stills from the making of the film taken by set photographer Peter Mountain. Provided in 1080p. Depp-Thompson Correspondence (HD, 14 min) - This supplement features actor Johnny Depp reading various letters between himself and Hunter S. Thompson during the periods leading up to production and then through post and the premiere. There are some interesting bits here illuminating the playful relationship the two developed and Hunter's writing is, as always, a feast for the ears. Sound is provided in a Mono track. Hunter Goes to Hollywood (HD, 11 min) - Directed by Wayne Ewing, this brief piece features footage of Thompson arriving in Hollywood to visit the set of the film and record his cameo in the movie. Highlights include Thompson giving Johnny Depp a strange mask as a gift which he states represents doom and gloom, Thompson talking loudly during the shooting of a scene and being politely and repeatedly told to keep quiet, and Thompson shooting his own brief cameo. Though short, it's interesting to see the real life inspiration for the film interacting with the various actors and filmmakers. Sound is provided in stereo. Audio discussion of WGA Dispute (17 min) - Provided in stereo sound, this audio only feature is a discussion between director Terry Gilliam, writer Tony Grisoni, and producer Laila Nabulsi about the complicated process of finalizing the writing credit on the film. It seems no Gilliam production can hit screens without some controversy developing, and here it was a case of the rigid and sometimes nonsensical WGA guidelines refusing to credit Gilliam and Grisoni for writing the final draft of the script. The conversation is interesting and provides a detailed account of the ridiculous ordeal. A Dress Pattern (HD, 1 min) - Provided with a Dolby Digital 5.1 track and optional commentary from Terry Gilliam, this brief short was made when it seemed like Gilliam and Grisoni would not be given writing credit. Originally intended to act as an introduction to the film, it features black and white footage of Ray Cooper humorously explaining that this is the first movie to be made without a script. Though a fun little way to start the film, thankfully it wasn't needed as the writers were given the credit they deserved. A Study in Marketing (HD) - The trailer for the film and seven TV spots provided in stereo sound. The trailer has an optional commentary from Gilliam explaining his distaste for the marketing campaign and what he would have preferred. Biographical Essay - An essay about Oscar Zeta Acosta, the inspiration for Dr. Gonzo, written by his son Marco. Photographs accompany the essay which provides some nice background on this important Chicano rights activist and attorney. The Revolt of the Cockroach People (HD, 30 min) - Provided in mono, this is a rare look at Acosta reading a chapter from one of his books at the Festival de Flor y Canto in 1974. It was definitely interesting to see the real inspiration for Del Toro's character in action. Thompson on Acosta (8 min) - Provided in mono, this audio only supplement is a recording by Thompson of his introduction to a 1989 reissue of Acosta's novels, 'Brown Buffalo' and 'The Revolt of the Cockroach People'. Again, Thompson's writing is always an interesting listen. Ralph Steadman Art Gallery (HD) - A collection of line drawings and color illustrations by frequent Thompson collaborator Ralph Steadman from various articles and writings provided in 1080p. It's easy to see the influence Steadman's work had on the look of the film. Breakdown on Paradise Boulevard (8 min) - Provided in stereo, this audio only feature is an excerpt from a 1996 spoken word album of 'Fear and Loathing in Las Vegas'. It features Jim Jarmusch as Duke and Maury Chaykin as Gonzo. The excerpt is from a scene not included in the film and follows the characters as they attempt to order tacos and continue their search for the American Dream. This is an entertaining listen and it's interesting to hear a different interpretation of the characters. Fear and Loathing on the Road to Hollywood (HD, 50 min) - The last supplement is the most substantial and is a 1978 documentary from the BBC following Hunter S. Thompson and Ralph Steadman as they journey from Las Vegas to Hollywood. This is a well made and interesting look into Thompson providing footage of his home and family. Thompson expresses great frustration with the press and public's expectation that he adhere to his written persona and laments the fact that his popularity has made it hard for him to be an observer. Also of note is a sequence near the end which covers Thompson and Steadman designing an elaborate monument to be built, that would shoot out Thompson's ashes in the event of his death. Thompson died in 2005 from a self inflicted gun-shot wound and his plans were followed exactly as detailed here almost three decades prior. 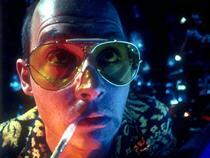 'Fear and Loathing in Las Vegas' is a disturbing and darkly humorous distillation of the American Dream. Its unrelenting style and refusal to provide easy answers may not be for everyone, but beneath its harsh exterior is an intelligent and soulful journey. The video and audio presentations are both good and serve the chaotic film well. Supplements are plentiful and informative. Overall, Criterion has done a great job with this release and fans should be pleased.